IIT Madras have few vacancies which they want to fulfill now; for that reason they issued an official notification related to this IIT Recruitment process. They are inviting all Indian eligible candidates to apply for these Government jobs under IIT Madras. There are total 25 vacancies for different job profiles which we explained below in the first table. Those who want to appear under this IIT Recruitment 2018 must read the full post before moving to online application form. What is the qualification Criteria for Various Job Profiles? SSLC with 2 year ITI Mechanic Motor Vehicle. 4-years Degree or 3 years Diploma in Civil/Electrical Engineering are eligible to apply. BE/B.Tech. in Mechanical Engineering can apply for this post. Those who have completed their Post graduation degree with at least 55% marks or its equivalent with excellent Academic record are eligible to apply for these posts. Age Bond: The Minimum age required for applying this IIT Recruitment is 23 Years and maximum age limit is 43 Years. How much is the Application Fee for applying this IIT Recruitment 2018? Indian candidates who are interested to apply for these Government jobs may apply Online through the official website. 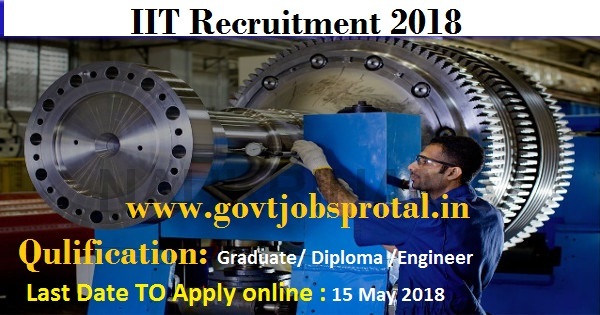 The all Indian People who are interested for these Junior Technician, Junior Engineer, Junior Technical Superintendent, Assistant Registrar, Deputy Registrar Job can apply now easily. 15 May 2018 is the Last Date to apply.